In addition to gameplay that is very similar to the TV show, there is also a sample contestant exam where you are shown 16 partially completed puzzles that you must solve within 5 minutes. Although success in the sample exam does not officially qualify you for the actual game show, according to the manual: "The sample exam ... is a very good example of how the official exam is administered and what the official contestant exam would be like in difficulty." Getting at least 12 of the 16 puzzles correct is considered a passing grade. 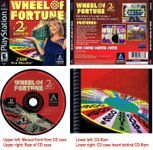 Wheel of Fortune is a game in which three players compete to solve word puzzles in an effort to win fantasy cash and fantasy prizes. When a player correctly solves a puzzle, that player gets to keep his/her cash and/or prize winnings for that round. The other two players' winnings for that round are erased. The "winner" is the player who has won the highest cumulative dollar value in both cash and fantasy prizes for those rounds played with the three players. The winner then gets to play the "Bonus Round."